If you were a child of the ’90s, it’s safe to say you saw the words “Executive Producer: Peter Engel” flash across your television screen at some point in time, ending every episode of the classic series Saved by the Bell. Generation after generation fell in love with the sitcom about neon-loving kids at a California high school, and we got to chat with Peter Engel about what started it all. 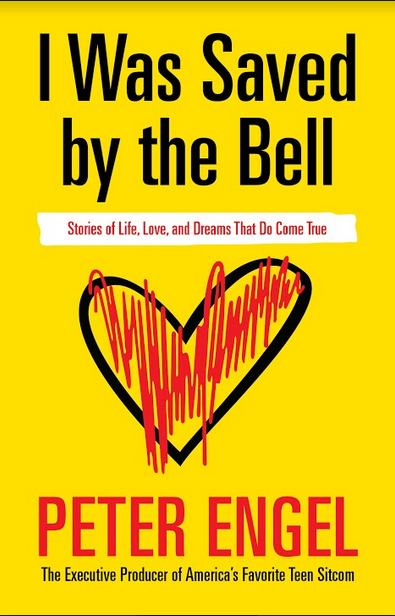 In his new memoir I Was Saved by the Bell: Stories of Life, Love, and Dreams That Do Come True, Peter shares the struggles he faced and how he never gave up until his dreams did in fact, come true. What prompted you to write the book when you did? Why was this the right time for you to tell this story? The book is a journey. [My] journey began as a kid who fell in love with television. [It chronicles] he ups and downs and how life throws you curve balls. It knocks you down, and there’s struggles, and … times I’ve had my heart broken over shows that coulda woulda shoulda. I had been writing it slowly for five years, but when Jimmy Fallon had the reunion – which I couldn’t have written better myself – with the cast on The Tonight Show, I called my son who works for YouTube and I said, “How many hits do you think we’ll get?” Well, we got 35 million hits that night. I said, “I better get this book out now.” *laughs* It seems for some reason that … people don’t remember that no comedy had ever gone to more than 6 countries. Bell went to 85 countries and impacted a whole generation worldwide – I call it the Bell Generation. We couldn’t figure it out at the time, but everyone goes to school somewhere and wanted to know how the California kids go to school. This is nostalgia. It hit a chord with a generation that keeps renewing itself. We took on things back then. First of all, the landscape we were in, I didn’t want to do the show. I didn’t want to do a Saturday morning show. I ended up doing a whole morning – I had 3 hours at one point. But people forget that our lead-in was The Chipmunks and our lead-out was The Smurfs. I didn’t know if anyone would even find us in that landscape, let alone turn into this iconic series. How was this trip down memory lane for you? I shared my whole life, from working for John F. Kennedy as a local organizer and being with him every time he was in New York City to my encounters with John Lennon and Jacques Cousteau, going to the White House with Screech and ending up hallucinating in the oval office with Warren Littlefield, the president of NBC at the time. It’s all how we met the cast [and] how we picked them. People forget they were only 14, and Dustin Diamond was 11. People don’t realize I was not only being the executive producer and writer, but I had to be the papa. I had to run a real school with two full-time teachers. One grade below a B and you can’t work in California. It was a family endeavor. How has the reaction been so far from readers and fans? I think it’s been terrific. We have limited distribution with Amazon and our website – we haven’t gone full blown yet. It’s been wonderful. What was your favorite part of the writing process? Did you encounter any challenges while writing the book? I wrote it as telling stories. The title is I Was Saved by the Bell: Stories of Life, Love, and Dreams That Do Come True. A lot of dreams don’t come true. I want to tell the story through the journey – I thought that would be more interesting to people. I personally remember your name vividly flashing on my TV screen throughout my youth. How much of a hand did you have in crafting some of those timeless shows? What was a day on the job with Peter Engel like? One show is a full-time job. I wrote, I produced, I led, I would be in editing, music. I had six shows at one point from 1996 to 2001. Nine seasons of Last Comic Standing – that was just a fun show. Bell was the time of my life. When we went to the beach club – I’m looking at the Pacific Ocean right now; I live on the beach, and the sun’s out. 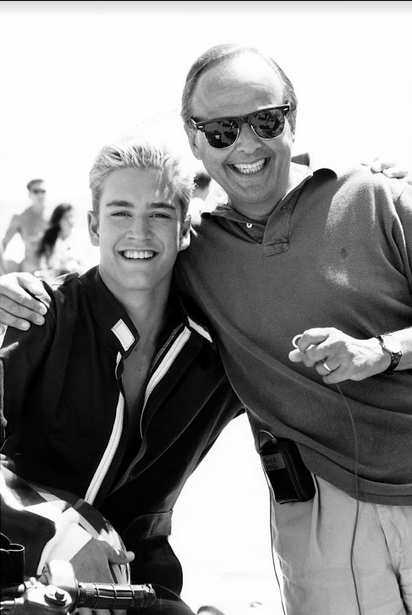 About 200 yards up the beach is where we shot the famous Malibu Sands episode with Leah Remini as Stacey Carosi. You were a part of so many things that have stuck with people through decades and generations. What does it mean to you to have something you worked on resonate with people after all this time? It’s amazing. I did a book signing at the NBC store where I started as a page. They brought all the pages down to the book signing. I went down to Chicago, where they have a Saved by the Bell restaurant, And it’s just like being back in the show. It’s perfect! They didn’t miss a detail. It’s called Saved by the Max. They were popped up for one month and sold out in 20 minutes, and now we’re in 2017 and it’s still going. It was awesome sitting in the same booth as the kids used to sit when I would give them notes in rehearsal. It’s gratifying, it really is – the impact on young people. We did a lot of things that no one was doing. We did a homeless two-parter about a girl living in the mall. We did a thing on drug addiction, drinking and driving, an oil spill based on the fact that Beverly Hills High School has an oil well on its land. And of course, we had the first cellphone on any TV show. It was a big one. *laughs* But no other show had a cellphone at that time. You’ve made headlines recently giving your opinion on the fate of some of your more iconic characters on Saved by the Bell. What prompted you to revisit the characters? Well, they asked me. *laughs* I was being interviewed and they asked where I thought the characters would be today. Would Zack and Kelly be together? Probably not, probably married to somebody else. Zack would probably be the head of a hedge fund or a talk show host. Kelly would have her own cooking show, which she does have and which I watch. Slater would be a football or wrestling coach at some high school, Screech would be Bill Gates, and Jessie would have just defeated or lost to Donald Trump. And Lisa Turtle would probably be Vera Wang. It just came to me – that’s what I thought. Your book is described as an “inspirational memoir” – what core message did you want readers to walk away with? Never give up. Dream big. Dream big dreams. Big dreams are as hard to accomplish as little ones. Never let anyone steal your dreams. No matter how many times you have your heart broken, you gotta come back and you can’t give up. If you haven’t had your heart broken, you’ll never, ever really appreciate the success in a hit as much. Buy the book! You can get it on Amazon, or get an autographed copy on our website iwassavedbythebell.com. Buy the book and never give up. Remember, someday, today will be a very long time ago. Don’t miss it. Thanks so much to Peter Engel for taking the time to chat with us! It was such an honor to relive these iconic ’90s stories with him. Be sure to pick up a copy of I Was Saved By The Bell by Peter Engel on Amazon or at iwassavedbythebell.com!